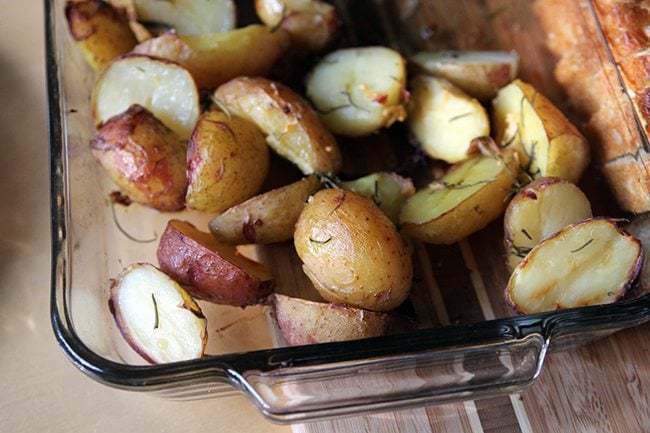 There’s a reason that Roasted Garlic & Rosemary Potatoes are so popular; they are easy, simple and everyone likes them. 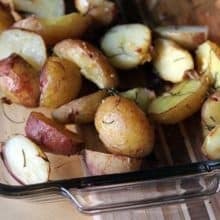 They are a sure-fire hit at every dinner party, your family most likely won’t turn up their nose at these – unless it’s my daughter who eats everything plain as can be – and these potatoes are so easy to make. 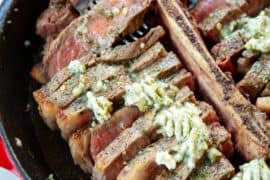 I almost didn’t post this recipe because it is so well-known, but I since I know that there are a lot of first time cooks out there who frequent blogs like mine looking for advice I figured that I should. These are perfect for those nights when you didn’t have any clue what you are eating for supper. 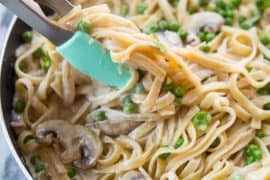 I can’t be the only one who always has these ingredients on hand and that’s what makes them so great and such a popular recipe. Let’s face it, December is craaaazy and not just for me. We are all rushing around so much that even I tend to forget about dinner and the simple fact that I have to feed my family at some point. Guilt confession: cereal and milk for supper happens in December more than any other time of year. Yup. I don’t even get sandwiches made, we just grab a bowl of cereal. This year is even crazier as we are packing up to head to Phoenix for some sunshine and fun in January! Oh, yes, the house sitter is booked, we have rented a house and we are living in Arizona for three months this spring! I cannot WAIT! Try not to hate me as I leave the winter behind this spring..will you still love me even though I will be blogging from Phoenix? Do I lose my Canuck cred for three months? Remember, I love you more that chocolate…. does that count? There's a reason this classic has been around forever, roasted potatoes with rosemary are the perfect side for almost every meal out there! 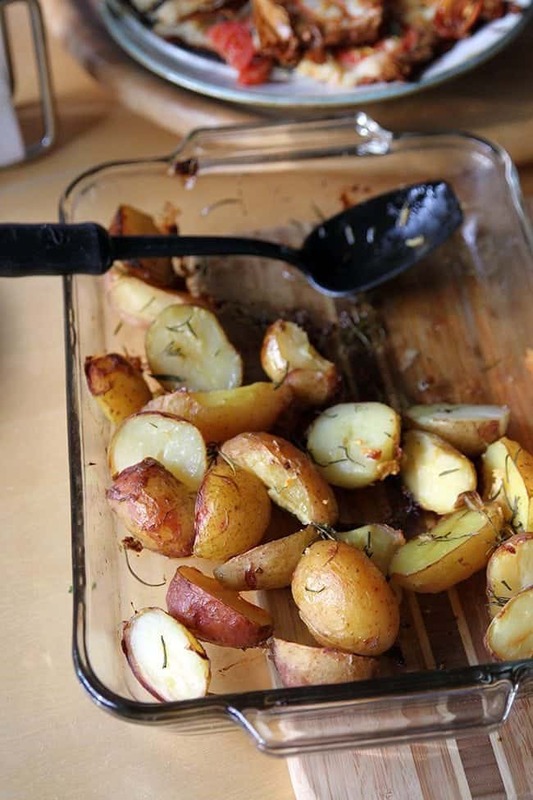 Cut the potatoes in half and toss in a bowl with the olive oil, salt, pepper, garlic and rosemary until the potatoes are well coated. Spread the potatoes out into 1 layer on a large baking sheet. Roast in the oven for an hour or until browned and crisp, making sure to turn the potatoes at least three times during roasting to ensure even browning. I add Thyme and lemon pepper….wakes them up really well. Wanda, made these with the little red potatoes you sent down. Really good, both Monica and I make them! 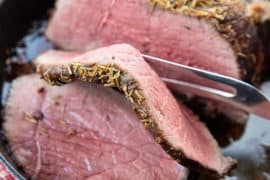 Years ago I bought a Jamie Oliver cookbook and made a roast with rosemary. We threw it away, tasted like pine trees lol. Eew! I love Rosemary but that sounds like my experience with cilantro. A restaurant overdid it and it took me a decade to eat it again, no word of a lie! These are amazing but it might take you a while to love Rosemary again! Great side dish for BBQ anything! Shared. Toss them in sunflower seed oil… Golden nuggets of love! Roasted garlic! I spread that stuff on everything… Literally. I tend to forget about the oldies…Nicole made it when we went over this summer and I was like WOW! I remember how good these are!